What does poverty feel like? What does it sound like? And more importantly, what does it look like? For many, the figure that comes to mind is likely someone of African or South Asian origin, perhaps someone from inland China, or a young family in Thailand or Cambodia. In the west that image might be a homeless Caucasian on a metropolitan street. Singapore is one of the last places associated with poverty. This is largely thanks to the image that the island’s government has cultivated over the years: since its inception in 1965, the country has worked towards the creation of a social structure that provides for its denizens. Or so the theory goes. Singapore is no exception to the rule that poverty is born from poverty, and while it is not in the same league as other developed countries, at an educated guess of 28%-45% poverty, it is certainly headed in that direction. What all of this alludes to is Singapore’s inclusion in the current global phenomenon of a growing middle class, where the lower classes are at risk of being left behind. But how, in a country as small and prosperous as Singapore, is this even a problem? The answer lies in the fact that it is a country full of contradictions. 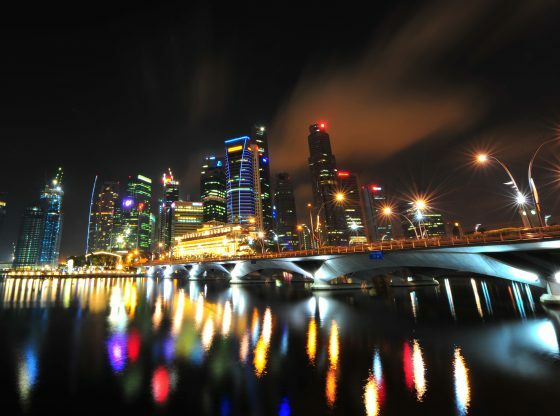 Singapore is a country that considers itself future-thinking, innovative, and expansionary. But it has fallen into the same trap as other rapidly growing countries –forgetting its basics. Here, success is defined by rank and perception. College professors are not considered worthy of the term ‘success’, but then again nor are businessmen who cannot show off their wealth. Meritocracy is the order of the day, where from the age of 12 children in local schools are divided into different classes based on expected levels of achievement. In theory, this works well – those with the aptitude to run a country, for example, are given the opportunity to work towards that; while those who are of less education-heavy stock will be nudged towards vocational education. In reality, these early divisions have become self-fulfilling prophecy. Government policy certainly does not help. It is common practice in Singapore to lead with the stick – prompting the internationally acclaimed phrase ‘Singapore is a FINE city’, referring to the practice of punishment and monetary fines for everything from carrying certain foods on public transport to falsely calling the cops out of neighbourly concern, minor misdemeanour to major crimes. In terms of poverty, the well-intentioned premise of ensuring kids go to school is prefaced by the fact that even public education costs money, which you cannot get without a job, a permanent address, and access to other forms of finance. Based on the Household Expenditure Survey (HES) – a 5-yearly local survey which studies expenditure patterns of the average household – Singapore has an estimated 14-16% households subsisting on a monthly income of SGD1500 or below. For perspective, the expected minimum monthly income for social inclusion and upward mobility would be at least SGD3000 for a family of four. But the average monthly wage for semi-skilled or white-collar labour is SGD1500 – SGD2000. Unskilled labour reaches around SGD1000 at best, both below the line for anything more than hand-to-mouth living. As a result, elders (aged 65 and above) form the largest portion of the economically disadvantaged in the country. It is not uncommon to see 75 year old men and women working menial physical labour jobs in public toilets, food centres and gas stations around the country, all in the attempt to continue earning money for menial savings, enough to cover the costs of basic survival like groceries, electricity, rent and limited medication. All this after working from the age of 18 (if they’re lucky) and the expenditure of family life. And with the rapidly ageing population, the percentage of poor households will only grow larger. Instead of considering the foundational reality of the situation, local organisations including the government, are quickly turning to bandaid cures – slapping on additional aid packages, encouraging larger families with monetary incentives, and providing subisidies – all of which inadvertently help only those who can afford to access them. Singapore is a country that considers itself future-thinking, innovative, and expansionary. But it has fallen into the same trap as other rapidly growing countries –forgetting its basics. Waste disposal, sustainable energy consumption, low-cost ethical manufacturing and consumption, long-lasting construction projects, care for elderly, the disabled, and the poor, are among those elements of social development that are recognised, fall high in concern but are yet without solid long-term plans. And to add insult to injury, an influx of westernised thinking has mingled with the local mentality, creating a rift and slowly eroding those values formerly recognised in Asia as indestructible – respect and kindness towards elders, empathy towards those less fortunate, sharing the fruits of hard work, and family. In its place, elders and the disabled without viable family are overlooked by neighbours and sometimes by family and friends, sharing is replaced by a desire for dispensible pleasures like branded goods and fancy food, and family is being replaced by a secret desire for independence. How then, can someone surviving below the local poverty equivalent keep up? The unfortunate truth is that unless the government mindset is refocused, they cannot. In Singapore’s defence, the government has been tasked with the impossible – keeping up the pristine, socially enviable image it has created over the decades. But the change requires lies in the root of a social order established a mere 50 years ago. The root needs to be reconsidered – in a country where people are not allowed access to their government accounts if they don’t have enough in them, the understanding that Singapore’s exorbitant cost of living means every penny counts is paramount. Recent plans for grand infrastructure need to be reassessed. Money for a trans-country highway could be put to better use providing aged care to the lower classes, or longer mandatory maternal and paternal leave, the possible conversion of unused houses into day-long childcare and elder day centres, are all just the beginning. In a country as small as Singapore, a discerning government is at an advantage if they take cues from the revolutionary ideas coming from the NGO and start-up sector. A government that prizes enterprise and monetary gain, could let the citizens do the hard work, and instead invest directly with those who have the mental capacity and drive to create and implement ground-breaking ideas. If any country in the world is capable of becoming a for-the-people, by-the-people nation, it’s Singapore. And yet we see another country making the mistake of investing in capital gains as opposed to human capital. Niyati Pingali works in an advisory role in the volunteering industry in Singapore. She is an alumnus of the University of Queensland, St. Lucia. Image Credits: CC by Flickr/Mike Behnken.